You are currently browsing the category archive for the ‘Mothers living apart from children’ category. In her book ‘Forgiveness & Other Acts of Love: finding true value in your life’, Stephanie Dowrick writes openly and compassionately about the six great humane virtues that can transform how we view our selves and relate to other people. They are the qualities of courage, fidelity, restraint, generosity, tolerance and forgiveness. When we live apart from our child, paying attention to these values can support, guide and sustain us at difficult times, like Christmas. I first read Dowrick’s book in the hope of gaining a greater insight into forgiveness, a difficult practice for many mothers apart from their children as they struggle with the pain of grief and loss. However, once I had the book in my hands, I realised that the virtue of forgiveness was the last chapter and that on reading – courage, fidelity, restraint, generosity and tolerance were important building blocks to the challenging task of working towards forgiveness of others as well as ourselves. Perhaps the virtue that could sustain us over the Christmas period is that of generosity. Generosity, says Dowrick, expresses and increases love and that every missed opportunity to be generous erodes our experience of love, connectedness and spirit. Generosity is looking beyond ourselves and understanding that we are all part of the human race. However, we know only too well that life can be unfair and other people can be withholding and malicious. Being repeatedly kind hearted to others who neglect us or treat us badly could at best, be ungenerous to ourselves and at worst, allowing ourselves to be taken advantage of by others. Some women in particular can be overly generous through conditioning or wishful thinking that the favour one day will be returned, from someone who is unable or unwilling to be generous. So we need to be at least as generous with ourselves as we are with others. When we extend generosity to others, we are in the moment, paying attention to what would be a kind hearted gesture towards them. Whether it is a big act of kindness or a common courtesy, we are momentarily freed from the grind of our dissatisfaction, the hatred we can feel towards others because we are feeling unlovely inside ourselves. Softening our hearts and extending kindness liberates us from resentment, anger, the narrow lens of our own perspective. Generosity allows us to connect to others and feel less alone, we feel a part of the community, a member of the human race. A generous act can lighten a heavy heart. How can we be generous? It requires that we stop and think, examine our intension, make a choice. It requires will. We hurry down the road and when we choose to allow someone space to come in front of us, we have momentarily stopped and reached out beyond the bubble of ourselves. When we make time for rest when we are tired, we have momentarily stopped the drive to keep going because we think we should. Both of these acts of generosity create a space for a moment of inner peace. In what ways could we be generous to ourselves and others over the Christmas period and during the year ahead? Spend time with others and feel connected. Take time alone and replenish yourself. Make allowances for other people’s stress reactions. Hurting yourself with punishing thoughts is unnecessary. Until you have evidence otherwise, choose to believe the least hurtful reason for someone letting you down. Let yourself off the hook. You know which hook! Smile at someone. Smile back at someone who smiles at you. If you are grieving, allow yourself time for this process. Be tolerant of others who are not grieving. If you can’t feel happy for them, that’s ok. Do what you need to do to take care of your own feelings. Do what you need to do to get through the Christmas and New Year period. Do you need to keep to your usual everyday routine? Do you need to make a new Christmas and New Year tradition? Do you need to be happy around your children when you see them but give yourself permission to do and be how you really feel when you are apart? Give yourself at least one treat this Christmas, what do you need – a gift, a walk, to book a holiday, a duvet day, good food, a box set….? Whatever it is, you’re worth it. What is Parental Alienation (PA)? PA occurs when one parent, usually the resident parent, undermines the child’s relationship with the other parent, resulting in the child’s rejection of that parent (target parent), based not on the child’s own experiences with the rejected parent, but rather as a reflection of the alienating parent’s attitudes. How does PA affect a child? The alienating parent’s needs are experienced by the child as more important and urgent than their own. They have to be loyal and devoted, and show they love the alienating parent best of all. Contact with target parent seen as a betrayal. Love becomes conditional, and the child feels they need to reassure the parent. In my experience, children tend to either align themselves with the parent they perceive as being more powerful (materially, emotionally and physically) to try to keep themselves safe, loved and validated, or, sensing the emotional vulnerability of the alienating parent, they take on an inappropriate caretaking role, sometimes feeling they need to step into the shoes once filled by the target parent. Either way, the child can swing from feeling intensely powerless in a painful situation to being powerful in ways that are not appropriate for them as a child. PA is very harmful to children and heartbreaking for target parents. The following thoughts are offered as a broader strategy for managing PA. Put yourself in your child’s shoes and take an honest reappraisal of the situation. What would they say has happened to your relationship with them? It doesn’t matter if this isn’t the truth of the situation from your perspective. There is no one truth, we all have a different view and experience of the world. Look for any grains of truth that could guide you to adjust how you communicate with your child now or in the future. Put yourself in your ex partner’s shoes and repeat the above. Even if your behaviour has been exemplary, having an honest look at the world from his viewpoint might guide you towards a different approach and/or help you to understand and support your child. Remember, this is not about letting him off the hook! Your reflections are about finding peace of mind and trying to build a relationship with your child. What has changed over the time you have been separated? As mothers apart, we have a tendency to see our child as the age they were when we last saw them. Their behaviour, beliefs, values will change. How have you changed? For example, are you managing your emotions better now than in the early days after your divorce? Are you happier and stronger? Do you need to communicate your new perspective to your child or your ex? How might life be if you weren’t separated from your child? Many families who are not affected by divorce and break up experience long lasting misunderstandings, rifts and estrangements. Most family units are far from perfect and many children either never truly separate from their mother (or father) or pull away completely, in order to separate. 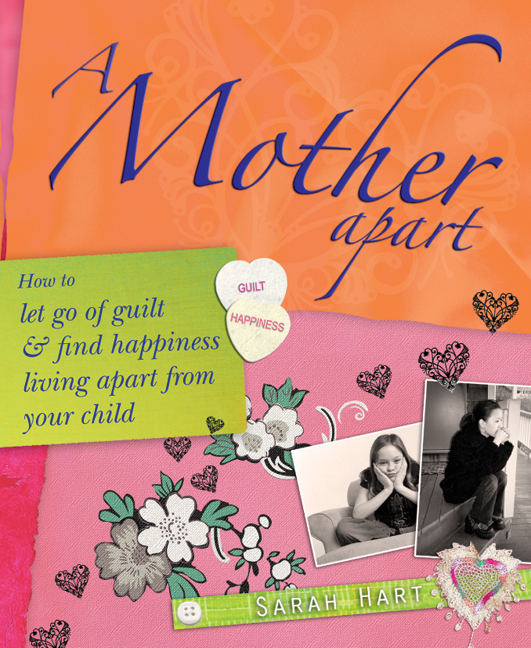 A mother’s job – whether you are a mother apart or not – is to let go so your children can come back to you. Life changes everything and everyone. Failure to acknowledge this results in black and white thinking. If as a target parent you examine any part you had to play, honestly, without beating yourself up for any mistakes, the shades of grey you find can ease your pain and release you from anger. Don’t react. It could be your child is being manipulated and is looking for evidence to reject you. Hold the adult place and don’t confuse your child with your ex partner even though they might sound like your ex partner. Show empathy and understanding. For example, say “I read somewhere that sometimes children think they can’t love mum and dad once they are divorced, but you don’t have to choose”. Agree to disagree. Don’t tell your child that she/he is wrong or doesn’t feel that way. Say you will agree to disagree and move the conversation on. Being in the moment. Resist the desire to ask questions about your child’s life with your ex partner or continually ask how she/he is feeling. Focus on your time with your child. Be in the present. Have fun. Talk about memories. Remind child of past happy times, show photos. Reminisce and repeat and build upon good times together. Just love your child, even though you feel rejected and your child’s behaviour might be difficult for you to manage. Let them know you will always love them no matter what. I wish you comfort and joy – you deserve nothing less. There has been some confusion about the exact date of ‘Blue Monday’ this year but some say that Monday, 24 January, was officially the most depressing day of the year in Britain. Apparently, foul weather, debt, failed resolutions and a lack of motivation conspire to make it the most anxiety provoking of the year. As worry is a topic which is often discussed in my work with mothers apart from their children, I thought I would write about ways to manage it. One of the worst things about worry is the way it seems to take over our lives. Worrying and obsessing keep us so tangled in our head we are unable to solve our problems. It can paralyze thinking and activity. Some of us are habitual worriers and have worried for years, sometimes having learnt how to be a worrier from our parents. For others, the act of worrying has crept into our lives when we became mothers apart from our children. Worry is a state of apprehension from anticipating a real or imaginary threatening event. It is therefore possible to put yourself through very distressing imaginings about something that will not happen. Worrying, obsessing and trying to control, are illusions – tricks we play on ourselves. We like to think this behaviour is solving our problems but it is not. Many people are superstitious about worry, believing that worrying will prevent something bad from happening. Just like managing guilt so that we can make ourselves happy as mothers apart, it is important to manage superstitious thoughts that tell us that feeling peaceful and calm is bound to make something bad happen. Most worriers would like to be completely free of anxiety immediately. Trying to change habits takes time. Like adjusting to living apart from your child, the trick is to take things easy, lower your sights and aim to manage worry. Organise worry. Set aside a time of the day to methodically review your worries. If a worry shows up before or after your worry time, write it down on your worry list for later. Choose a certain time of day and a place for worrying. Avoid your bed as it should always be associated with your peaceful haven. My clients often say, “I can’t do that, I don’t have control”- but think for a moment about how many times you worry and are interrupted by the phone or some other distraction. This means that you do set worries aside without realising it. You can learn to put aside a worry and get on with living your life in the here and now. You will also notice that a worry that felt strong at 10am has shrunk in significance by a worry time of say, 4pm. Aim to reduce your worry time from ten minutes to five, to two minutes per day. If you begin to make a joke of your new worry time habit with other people, then so much the better. Focus on solving the problem if it is in your control, not your “what if…?” thoughts. What precisely is the problem or goal? List all possible solutions. Asses the main advantages and disadvantages of each one. Choose the most practical solution, the one that will most easily begin to solve the problem. Plan steps to carry out the best solution, listing the resources needed and pitfalls to overcome. Review progress and remember focus on what you have achieved first, before what is still to be overcome. Rehearse the statements until they become an automatic response to worry. With practice you will experience fewer and shorter spells of worry. As ever and especially when you are feeling worried and anxious, take outrageously good care of yourself. Get outside for some exercise, eat mindfully, treat and pamper yourself and make sure you get enough sleep.